From the introduction of a new operating system, new Mac technologies, and a new CEO, to the discontinuation of a popular laptop and the death of Apple’s cofounder, 2011 was a year of beginnings and endings for the Mac. As we prepare to enter a new year, let’s take a look back at the previous 12 months, from a Mac perspective. The story of the year for Apple—and for technology, business, and pop culture in general—was the death of Steve Jobs on October 5, 2011. Jobs had battled cancer since 2004, taken a medical leave of absence twice, and undergone a liver transplant in 2009. 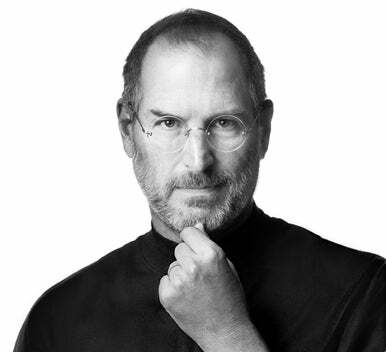 Steve Jobs died in October from pancreatic cancer. Jobs’s death triggered an overwhelming outpouring of emotion and fond memories from all over the world. Apple customers flocked to Apple Stores to pay tribute, and Apple set up a website memorial. The Web was flooded with stories from people who had some sort of interaction with Steve Jobs; many stories came from people who worked closely with Jobs and offered new insight on Apple’s cofounder. Others talked about how they were influenced by the man, even though they'd never met him. You can read the eulogies written by Macworld editors and contributors in our special Steve Jobs section. Jobs was intensely guarded about his personal life, and details about his illness were not disclosed when he was alive. (In fact, at this time last year, I wrote that Jobs was alive and well. Alive, yes, but he wasn’t well.) But a few weeks after his death, the publication of the biography Steve Jobs allowed the public to know much more about the man. Written by Walter Isaacson, the book not only detailed the highlights of Jobs's career and the products that made Apple successful, it also covered his childhood, his life with his wife, children, and sister, and his illness, among many other things. The book quickly became a best-seller. In August, weeks before his death, Steve Jobs resigned as Apple CEO, and he recommended Tim Cook as his replacement. Cook, who had previously served as Apple’s chief operating officer, as well as interim CEO during Jobs’s medical leaves, was immediately named Apple CEO. Can Cook maintain Apple’s momentum? That’s the challenge he faces in the years ahead. Apple believes he’s up to the task, and fortunately, he won’t have to do it all by himself. Jobs hired Cook to be part of a group of executives that fit the image that Jobs had for the company—a group that worked closely with Jobs to define and understand the Apple way of doing business. Also, according to reports, the company created Apple University to teach its employees the Apple Way. Jobs can’t be replaced by one person, but Apple certainly isn’t doomed. The Apple executive team will work together to maintain the company’s success now and into the future. We provided a close look of the new features in Lion. Senior Editor Dan Frakes put together a complete guide to installing Lion, and Senior Contributor Ted Landau offered a few fixes for troublesome Lion installations. Landau also looked at some compatibility issues your applications may have with Lion. Initially, Lion was available only through the Mac App Store for $30. On the day of Lion’s release, Apple reported more than 1 million downloads of the new OS. In August, Apple released a $69 USB installer for anyone who did not or could not download the OS from the Mac App Store. The Mac App Store, which played a major role in the release of Lion, opened its virtual doors during the first week of January. At first, the store had more than 1000 Mac apps; the store now has several thousand programs. It gives Mac users a very easy way to find and buy software, often at very attractive prices. The Mac App Store has become a core part of the Mac experience. For an app to be sold through the Mac App Store, however, developers must follow Apple’s guidelines, which means that some useful and well-written apps aren’t available through Apple’s store. Also, in March 2012, Apple will require developers to implement a security system called sandboxing, which may require some developers to remove certain software features. In December, Apple announced that the Mac App Store passed 100 million downloads, so the Mac App Store is a valuable resource, but there will always be a reason to download apps directly from a developer. In October, Apple’s free iCloud service was made available to the public through the OS X 10.7.2 system update. iCloud uses the Internet to provide access to your documents and content on all your devices, without your having to put much effort into syncing your data. For more information, you can read our article that answers the most frequently asked questions about iCloud. If you haven’t signed up yet, Macworld Staff Editor Serenity Caldwell tells you what you need to know to get started with iCloud. If you are a MobileMe user, take note: Apple announced plans to stop the MobileMe service on June 30, 2012. 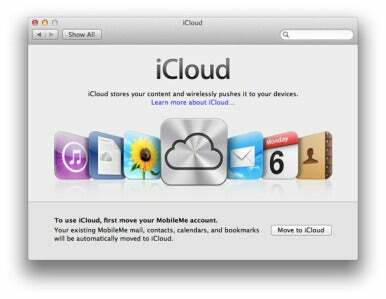 Apple wants MobileMe users to switch to iCloud, but before you do, you should know that not all of the services you’re used to in MobileMe are available in iCloud, such as iWeb publishing and iDisk. You’ll have to find non-Apple alternatives for such services. Macworld Senior Editor Jackie Dove examines why Apple pulled the plug on MobileMe. The introduction of Thunderbolt was the major development for Mac hardware in 2011. Previewed years ago as Light Peak, Thunderbolt is a connectivity technology developed by Apple and Intel. Its high speed is ideal for external storage devices, video-capture hardware, network interfaces, and video for displays. Thunderbolt made its debut in February, with the release of the Early 2011 MacBook Pro models, and is now standard with all new Macs—it was also included in the 2011 models of the iMac and Mac mini. New technologies like Thunderbolt inevitably raise questions, and Macworld Senior Editor Dan Frakes answered the most frequently asked questions about Thunderbolt. To take advantage of Thunderbolt, you need Thunderbolt devices—but unfortunately, such devices are only slowly trickling out to market. The first Thunderbolt peripherals to arrive, the Pegasus R4 and R6 RAID arrays from Promise, shipped four months after Thunderbolt’s debut. Although the benchmarks from the Pegasus R6 were impressive, the product's specs and pricing are indicative of the Thunderbolt peripherals that are actually available—they’re high-end, pricey devices ideally suited for professionals. Macworld contributor Joel Mathis found that component prices and technical issues have hindered the release of Thunderbolt peripherals. 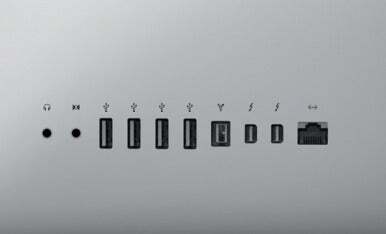 Thunderbolt ports, such as the two here between the FireWire and ethernet ports on the back of the 2011 iMac, were introduced as standard features on updated Macs. Apple’s Thunderbolt Display—released in September, seven months after Thunderbolt’s introduction—exemplifies the versatility of Thunderbolt. The display essentially serves as a dock for the MacBook Air, allowing you to use FireWire, USB, and ethernet on the laptop through the display. With the Thunderbolt Display, Macworld Lab Director James Galbraith was able to connect a few other Thunderbolt devices, and he examined the complexities of Thunderbolt daisy chaining, as well as how devices affect each other’s performance. The MacBook Air is now the darling of Apple’s Mac lineup. It’s not the fastest Mac, but it offers excellent performance in an ultraportable design that’s very appealing—so appealing, in fact, that PC manufacturers are using Intel’s Ultrabook platform to make laptops that are very much like the MacBook Air. The MacBook Air set a standard of excellence that PC manufacturers hope to replicate. Apple updated the MacBook Air in July. The update provided major performance increases by using Core i5 processors (and Core i7 processors in build-to-order models). The MacBook Air now has Thunderbolt, which helps solve many of the connectivity complaints about previous MacBook Air models. When connected to a Thunderbolt Display, the MacBook Air can serve as your one and only Mac, not just as a portable complement to a desktop computer. The evolution of the MacBook Air led to the demise of the plastic, entry-level MacBook. Customers looking for a Mac laptop on a budget will have to turn to the $1199 13-inch 2.4GHz Core i5 MacBook Pro, or to one of the 11-inch MacBook Air models, priced at $999 and $1199. If you really want a plastic MacBook, you’ll have to find a used one for sale, or check the refurbished section of the Apple Online Store regularly (there weren’t any refurbished MacBooks when I checked last week). Apple released not one, but two updates to the MacBook Pro in 2011. The first update was in February, while the current MacBook Pro models were introduced in October. The update in February saw the end of the Core 2 Duo being used in the MacBook Pro, and ushered in the new Sandy Bridge processors. The update in October bumped up the processor speeds, storage capacity, and graphics. The major desktop development appeared with the Mac mini update in July—the computer came on the scene without a SuperDrive, bringing back memories of when Apple decided to do away with the floppy drive on the iMac in 1998. Apple doesn’t think there’s much use left for optical drives, with the Mac App Store available for procuring software, iTunes for getting movies and TV shows, and Internet connectivity, so don’t be surprised if you notice a lack of SuperDrives in other Macs in the future. The new Mac mini: No SuperDrive. Thanks to the Core i5 processor, the 2011 Mac mini offers a huge speed improvement over its Core 2 duo-based predecessors. And, like the MacBook Pro and MacBook Air released earlier in the year, the Mac mini has a Thunderbolt port (replacing the Mini DisplayPort), though it still also has a FireWire 800 port, four USB 2.0 ports, HDMI, gigabit ethernet, and an SDXC slot. The iMac was updated in May, with new Core i5 processors, new graphics processors, and Thunderbolt. Previous iMac updates saw marginal speed increases, but with the implementation of the new Sandy Bridge processors, we saw a more significant speed boost. 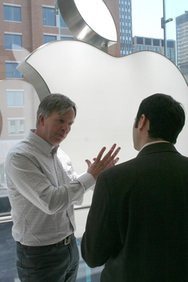 Senior VP of Retail Rob Johnson resigned from Apple in 2011. May marked the tenth anniversary of the Apple Retail Stores. Apple didn’t do much to commemorate the event—the company says it prefers to look forward rather than celebrate past achievements. Apple's first retail store, in McLean, Virginia, did have a small celebration, as documented by ifoAppleStore.com’s Gary Allen. The man behind the Apple Retail Stores, Rob Johnson, announced his resignation in June to become CEO of J.C. Penney. Johnson’s departure didn’t stop Apple from opening more stores; among the dozens of new locations were Grand Central Station in New York; Hong Kong; Valencia in Spain; Sulzbach in Germany; and Anchorage, Alaska. In addition to opening new stores, Apple plans to build a new campus. In June, Steve Jobs presented plans to the city council of Cupertino to build a spaceship-like circular building that will fit 12,000 employees. Apple last updated the Mac Pro in August 2010. A few Apple products saw no major upgrades in 2011. The most notable was the Mac Pro, which was last updated in August 2010. The lack of attention paid to the Mac Pro fueled the rumor mill with speculation that the Mac Pro would be discontinued. People forget, however, that Apple has done this before; 19 months went by before Apple finally updated the Mac mini that was released in 2007. The fate of the Mac Pro remains to be seen, but it’s possible we haven’t seen the end. Apple’s iLife and iWork software suites saw only incremental maintenance updates. Apple’s latest versions of the AirPort Extreme and Time Capsule were released with little fanfare, with the upgrades offering better performance. What’s in store for 2012? Plenty—so much, in fact, that Senior Associate Editor Dan Moren takes a look at Apple and the year ahead in a separate article.